Earth Day is April 22, but libraries help reduce your impact on the planet every day, because we reuse our collections again and again and again! That means fewer resources and energy are consumed to meet the needs of many people, and fewer items are discarded as a result. And most of the materials that we eventually withdraw continue to be reused. They may land on the library sale shelf, be sold online, or be donated to Goodwill. Sometimes, withdrawn books in good condition go to school classrooms and libraries, or the VA hospital. So, take action to protect our beautiful planet when you celebrate Earth Day this month, and when you use your library all year long. Want to do even more? 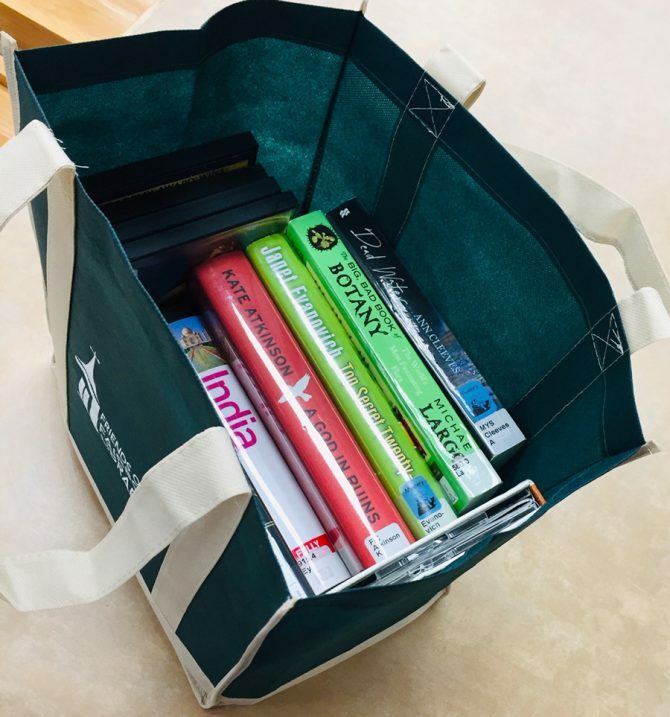 Use tote bags instead of disposable plastic bags to carry your books! Buy one at Fairborn Community Library’s circulation desk for only $4.